It's "mud season" here in Vermont. Everything is brown with earthyness which is a nice way of saying mud and last years dead drying yellow and ecru sticks and stems. Bits of bark and moss lay strewn on the ground from the animals foraging in the trees over the winter. When walking in the woodlands this time of year I find myself looking for and reveling in any fresh green new life I see popping up from the ground. After a long winter just seeing a young sprout of green can give me a thrill. Yesterday I picked up some of the "bits" and made a small quilt. I will use it for a mug rug inspired by the mud :-) I learned that you can not sew thru birch bark on a sewing machine, it just splits and you can sew on these bits by hand but it helps to sew a button or bead on top of the fragile bark moss bits helping to hold it together better. If you made a small quilt of the colors of your day (and you should do just that) what colors would it be? The sky is the window to the rest of the universe. So when making a quilted fabric landscape the sky may be my favorite part and I want to share how I've been doing the quilting on my skies lately. My quilting is not and never will be perfect or symmetrical but what windy sky is? The thread should have been matched to the background sky alittle better on this one but it does make a statement :-) a turbulent stormy sky in Kansas? Practice, practice - and remember, nature is not perfect and all the same nor should your quilting. Practice on paper first before you go on the machine. Relax and have fun with it - I promise you, once you get this down it becomes addicting and you will be quilting windy skies on everything! I went to a gallery today that had the work of Deidra Scherer. Her portraits of the elderly made of fabric and thread are wonderful! Her website is here if you want more information on her. A very talented artist. This one reminds me of my beloved grandmother. Her thread work is simply zig zag. Nothing fancy and the fabrics ordinary thrift shop stuff. It just goes to show you that one does not need to have expensive batiks or hand dyes to make something worth looking at and admiring. 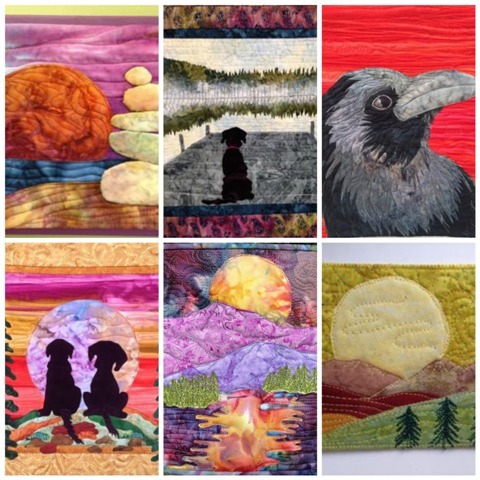 She doesn't quilt her pieces, they are left with the edges raw - matted and framed. I would never thought to use these fabrics but they total work with these faces. I finished a real quilt! It's been many years since I've done a patchwork quilt. My fabric obsession is satisfied by the wall art variety of quilting usually. But my mom gave me this gorgeous pieced top already basted and ready to quilt. So I took the opportunity to go thru Leah Days craftsy class volume one and practice and learn with this quilt. This pattern is perfect for it with all the boxes. I did a different design in each square or rectangle. It's very densely quilting and I love it. This will be my everyday couch cuddle quilt. One of the quilt shows I watched had a woman who does amazing 3-D fabric art show how she makes her leaves. I can't remember her name but will find it and add that information at the end as an update. You basically take your leaf shape and sew it onto felt before you cut it out making it easier to deal with. I'm doing this from memory and couldn't remember if she used fusible or not. The front one I did not use fusible and sewed the vein lines first. See how it bubbled up? I'm not saying that's wrong, maybe you want that effect. The one in back is fused and I outlined the edges first. It lays flatter. I like that way better. So then on the back you zig zag carefully some wire on the middle vein line leaving a few inches free at the bottom for a stem. Now remember I am using what I had at hand. She says to use floral wire which is green and you would want to use felt, fabric and thread that would blend together not the blazing orange and brown thread as shown here. Then cut it out and wrap the part of the wire that hangs down in floral tape. I think I would take the time to do a satin or narrow zig zag along the edge. It seems to fray with just outlining it. But see how it bends! I'll have to try some with the right color thread. That middle stands out like a sore thumb but you get the idea. I will have to get Glen from Lousianna to move here quickly with her beading boy toy. Wouldn't these be cool with some beading added? Her work is something else - lol! The person I made it for wanted a green border. I love this dark green tree batik. I always quilt around every motif to make sure all is secure.